I still haven't been able to find my gold powder. Look harder - they're on top of the thing, but under the do-dad that's covering the thingamabob. 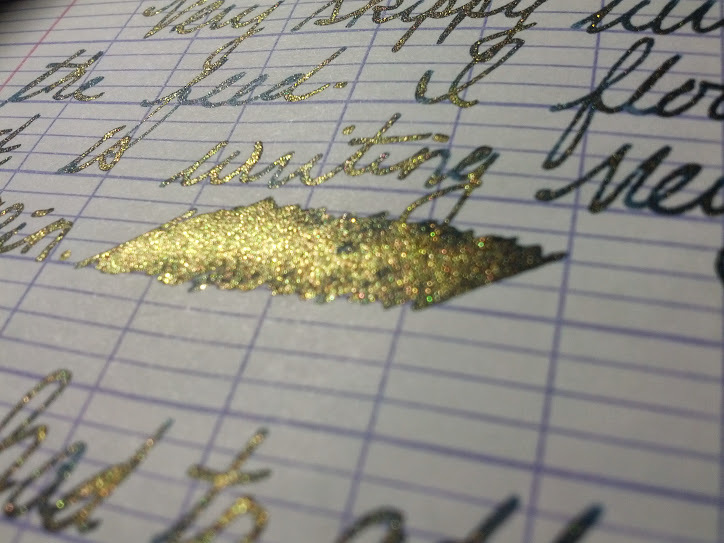 As a quick experiment I tried mixing some purple mica, the stuff that is used in cosmetics, into black ink and used a glass dip pen to test (wanted to test the mica first before putting it into a fountain pen) and it worked very well. The mica mixed with just a few shakes of the sample vial. This is going to be fun. No affiliation and all that - I simply bought mine there. Having written the above too quickly, I should add that the micas' colors come mostly from metal oxides, so they aren't pure mica. But metals are minerals too . And there are some exceptions as well, like carmine. We want pictures, we want pictures, we want pictures!  Edited by LindaM, 12 November 2014 - 23:03. Can't tell in the writing sample, but the two swabs look pretty cool. 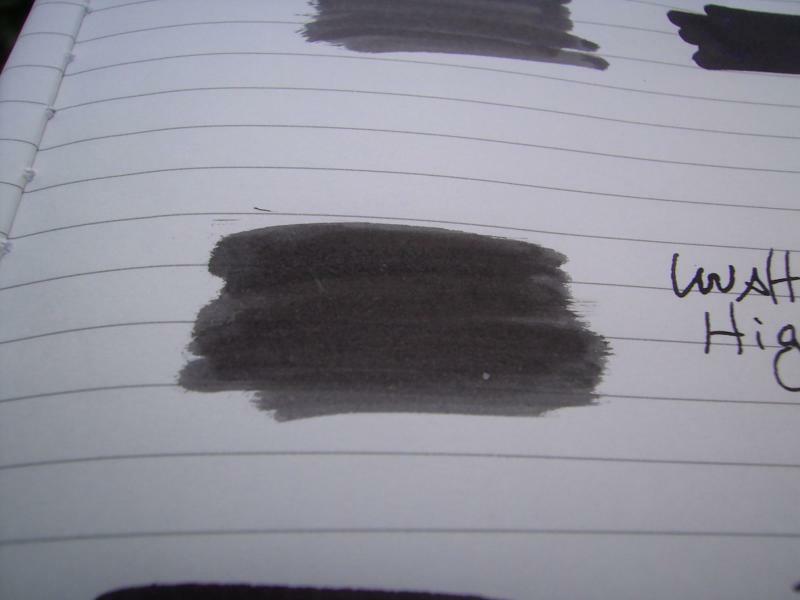 Maybe there's hope for black ink after all! I'll try to do a better job of the picture tomorrow, but all the blue you see in the picture is the sheen. It's looks great in person, very shimmery. If possible, please consider doing a side by side with the original black ink. That may help us mentally auto-correct for artifacts of the photography. Well, I've been trying to do a better job on the pictures with purple mica added to black ink. The problem is that my camera absolutely will not focus on anything too close to it. It seems to have developed presbyopia too. So, while I can't show you the sheen in the letters because of the focusing issue, I can show it to you in the swabs - I hope. The picture I put up yesterday looks better here than it does online. So - cheap Higgins India black ink (since I knew I was going to use a dip pen, and purple mica. The first picture is the plain black, the second is with the mica. Something unexpected - each time I tried this, the ink with the mica was much wetter and darker than the original. Not sure what's going on there. The mica is the only thing I added to it. Also, it now being most of a day since adding the mica, thus far there's no strange behavior from it - no gelling or any such. I hope you can see these better. If not, maybe I could send a mica sample to someone with a better camera. I see what you mean about looking darker. The top swab and the bottom swab don't look drastically different, but the swab to the right in the first photo looks like a completely different ink. That's a pretty cool effect. 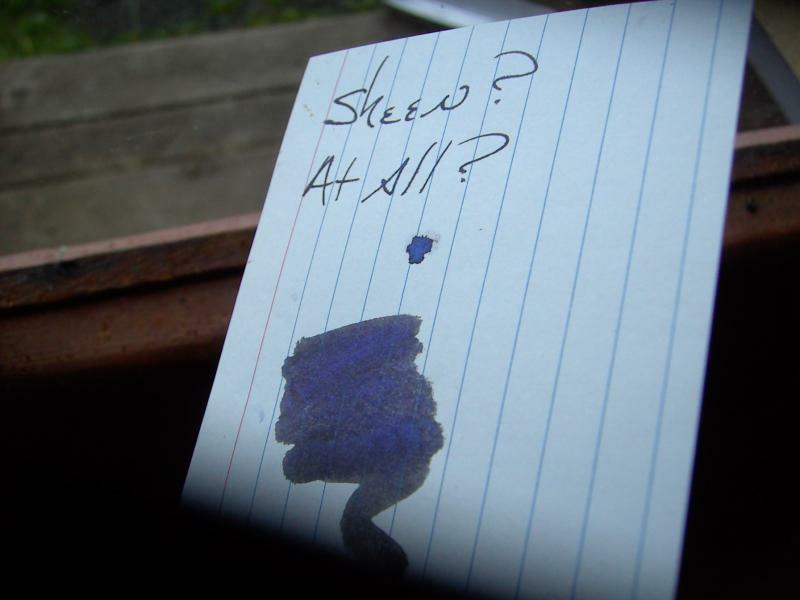 The top swab was 3 or 4 layers of ink to darken it down to where it would photograph better. The upper center swab is a single layer. The really dark swab in the upper right is the one in the second photo. I ordered the 6-pack of dust from amazon and got gold, silver, bronze, copper, pearl, and chestnut. I figured this would give me lots of amusement. My first test was using the chestnut mixed with Noodler's El Lawrence. I apologize that I'm not able to get a picture of it that shows the effect, but it is pleasing and subtle. It doesn't produce any big color shifting effect, it just adds sparkles that show in bright light. It isn't too showy but really turns a kind-of-dull black into something eye catching. It flows easily and writes well and we'll see how it cleans soon. I want to try the silver in a blue next. Very cool - I didn't realize they sold a 6 pack. Silver powder in blue ink would look really nice, I think. The gold seems to be a bit overpowering for my tastes. Red might be cool too - I wonder if the sheen would make it look purple? So of course I added more dust because if a little is good more must be better. That's when the real flow problems start (around 1.3-1.5 tsp). This clogged the feed. So I flushed the feed well and everything is fine. As you add more dust the mixture definitely thickens. I think this will probably work best with very wet nib/feed combinations and may be better with wetter inks. Still, the effect here is very nice and I can hardly wait to do some Christmas cards. Edited by Medsen Fey, 14 November 2014 - 15:23. I looked at my measuring spoon and realized it is a ½ tsp so the measurements above need to be cut in half. Edited by Medsen Fey, 15 November 2014 - 00:48. The nice thing about this is that you can simply add more ink to offset too much added powder. I slowly inverted my sample vial of Kon-Peki and gold powder and the gold clung to the cap for quite some time. It seems that the gold will stick to itself and cling to whatever surface it is on, provided it is pretty dry. A quick shake saturated the powder enough with ink that it all ran down the side of the vial again. 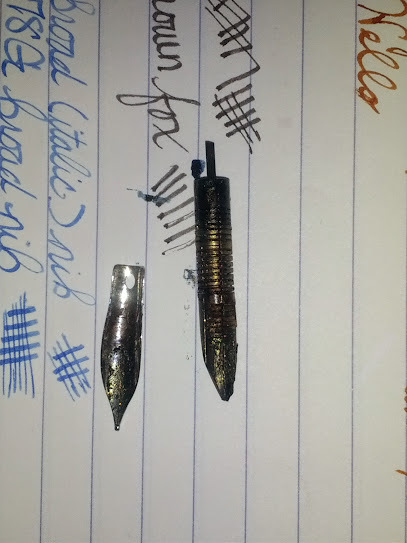 Okay, here's the results from leaving the pen nib down and uncapped for just over 5 days (122 hours). Very picture heavy. Before writing, I disassembled the section, nib and feed. 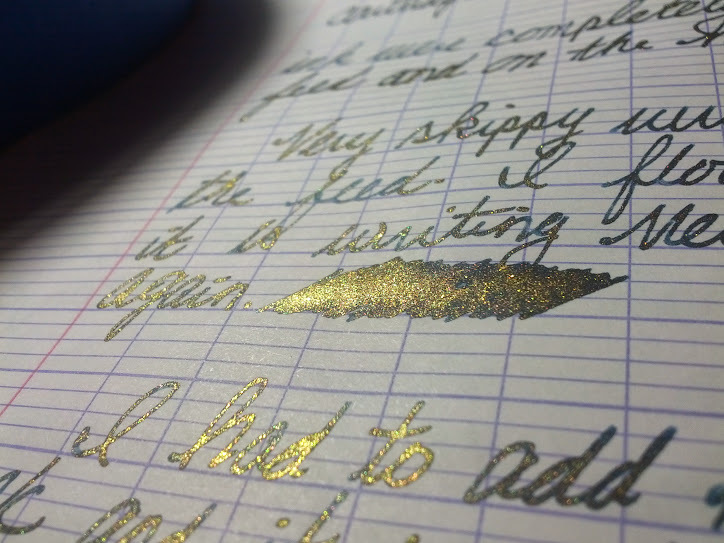 The ink and gold mix had completely dried. 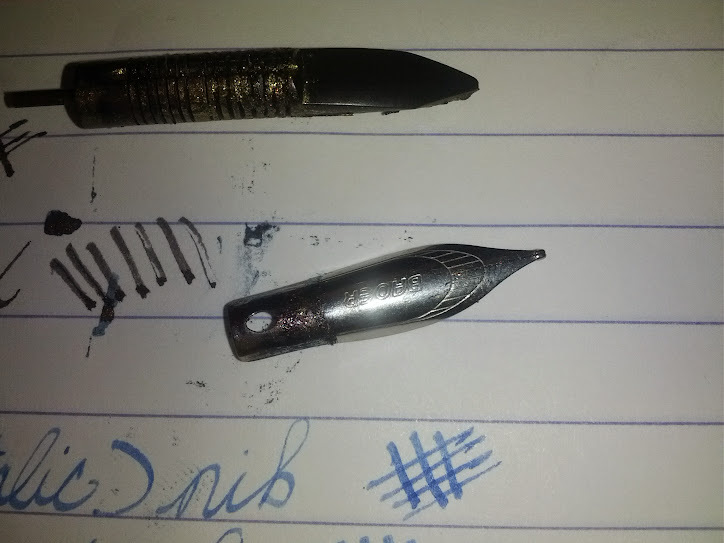 There were no signs of crusting on the feed, but the nib was pretty ugly looking. It appeared as though there could be some signs of rust. In the picture take notice of the dark crud at the nib's mid-section. In person, this looked very brown. The breather hole in the section was heavily caked with gold powder, but did not look clogged as the gold was only resting on the "rod" rather than in the entire hole. The cartridge converter suffered from some serious evaporation. There was only about .5 centimeters of ink left from a 3/4 fill. There was not enough ink left to make the pen write even after flooding the feed. I mixed the bottle before adding more ink. 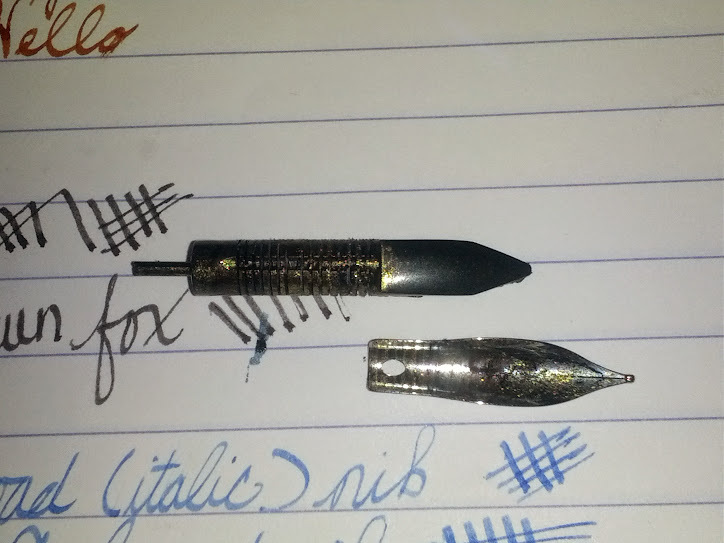 After a second flooding and some slight nib pressure (to presumably drag trapped gold powder from the nib slit), the pen wrote. It was very dry and slightly scratchy. Skipping became an issue, needing to tap the pen every couple of letters. 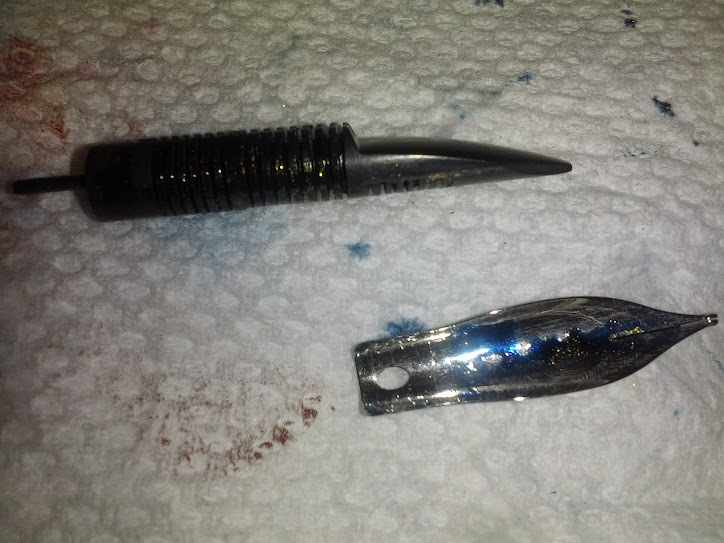 A second flooding of the feed (this time, without backing the piston off) the pen wrote very wet and smooth again. 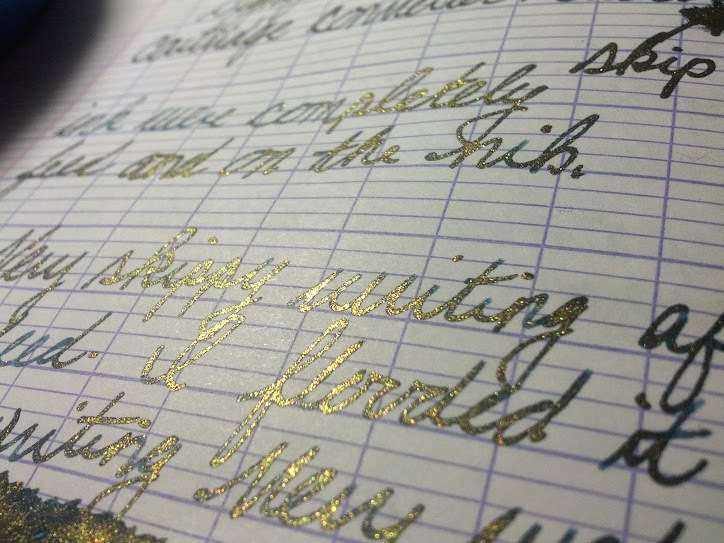 The writing had intense gold sheen - much more than prior tests of leaving the nib inverted for a day. 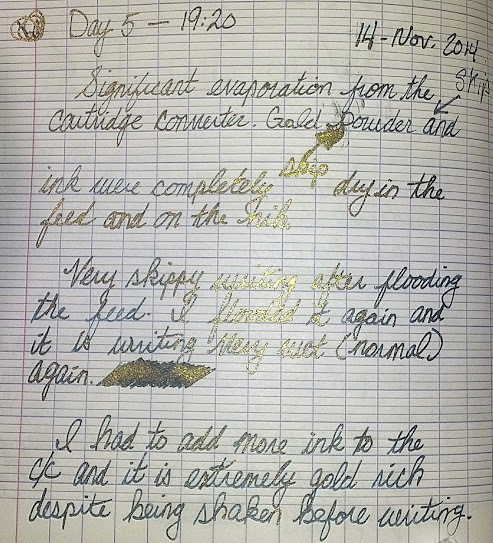 I presume this is because much of the ink had evaporated, leaving all of its gold in suspension behind. 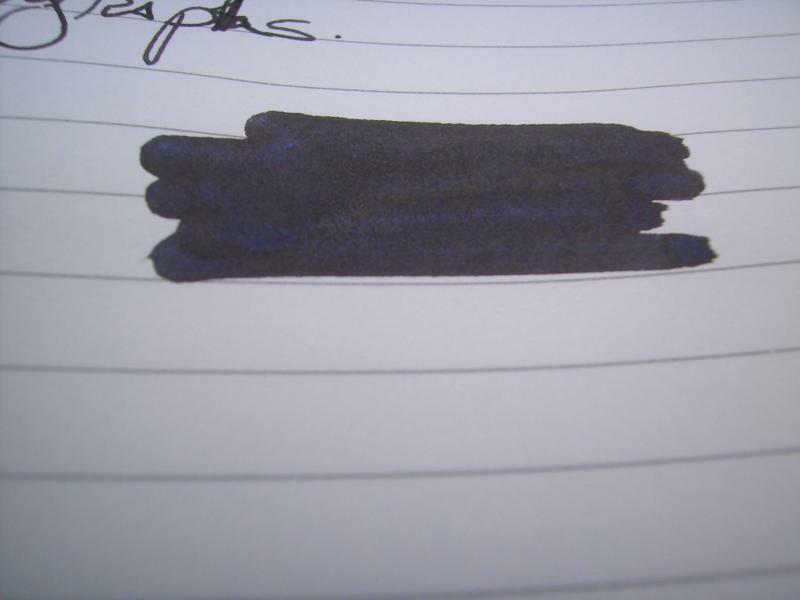 Adding more ink was enough to resuscitate the pen's ability to write, but left it a much more saturated mix. Cleanup was significantly more difficult than standard ink. 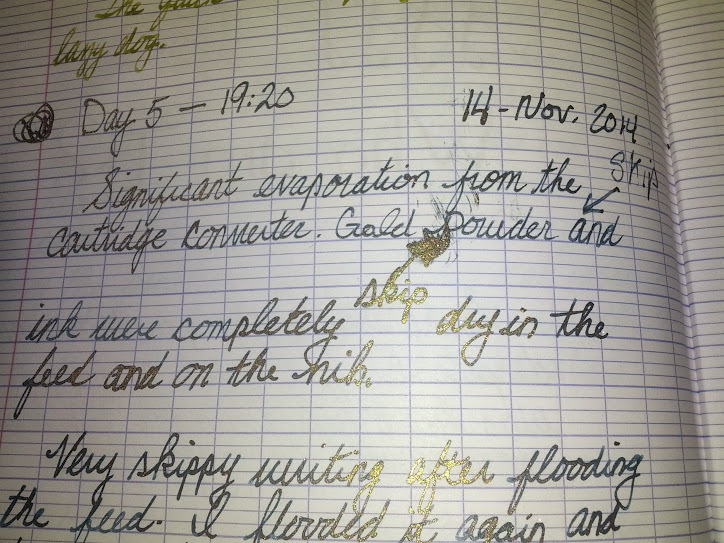 The gold powder did not present much of a problem, but the ink had became so dried and saturated that it took a significant amount of water to remove most of the color. 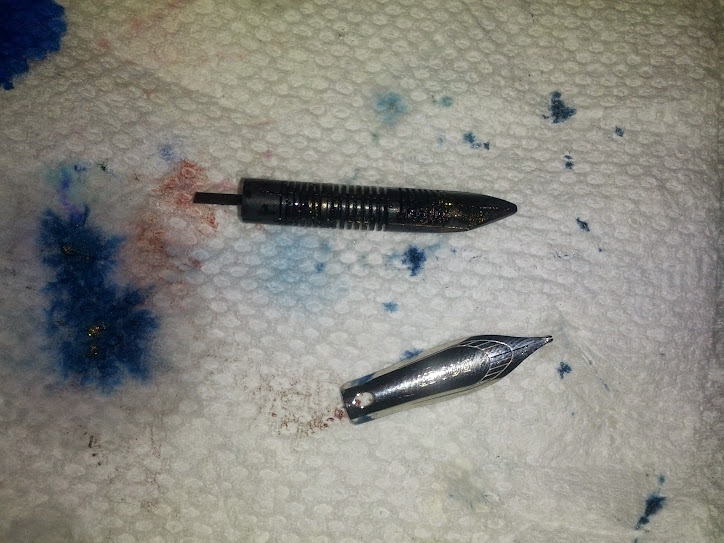 After disassembly, ink could still be seen on the nib. Held to the light, small amounts of gold could still be seen stuck in the feed. 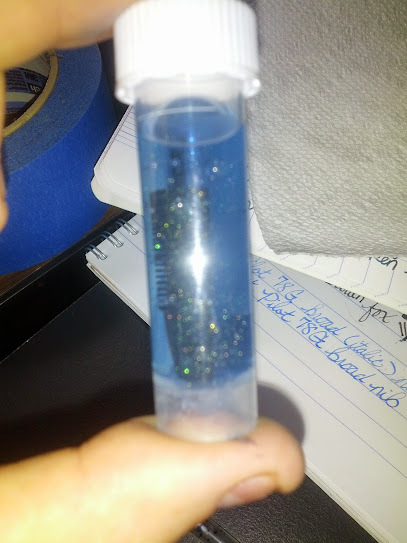 I put the section, feed, and nib into a sample vial filled with water. Shaking it removed much of the gold and dried ink. After a soak and further rinsing, it should be completely clean. I should also note that I've dedicated a syringe to fill inks that have gold powder in them. It appears that it rinses out thoroughly. This pictures shows the excess water squirted onto a paper towel. 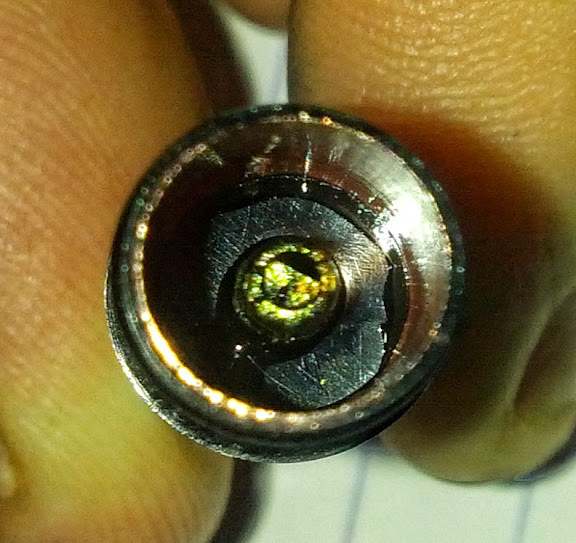 No gold particles are visible when held to a light source. 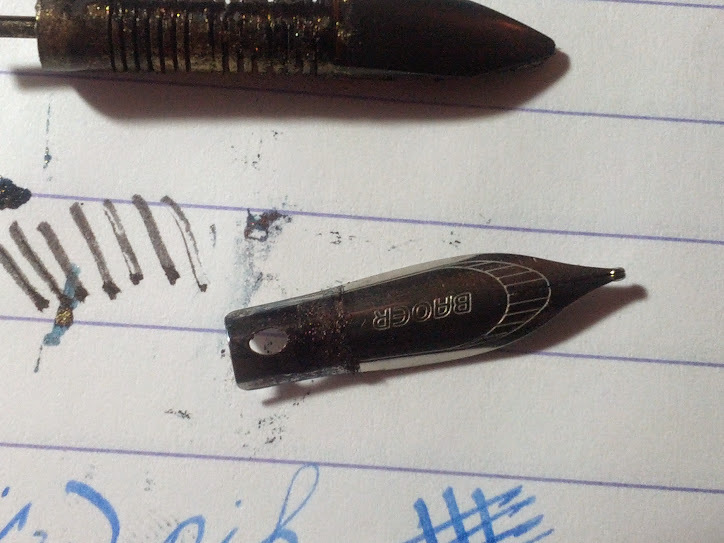 The circle was drawn around the water spot with the nib prior to cleaning the pen.